We've been raising, selling and showing dachshunds since 1968, which means we have the experience and expertise necessary to produce the best dachshund personalities, temperaments, conformation, coats and bloodlines in our Colorado State-licensed AKC kennel - where every pup and dog is special. Our many repeat customers are proof of that! We have a good selection of nearly all the dachshund patterns, colors, and coats - and dachshunds have more combinations of those traits in every size (standard, 'tweenie,' miniature and the unofficial 'rabbit' - the ultra-mini) than any other breed! If we don't have exactly what you need right now, consult with us and we'll do our best to produce it. We probably have the best selection of miniature dachshunds in this region, and we're constantly working to improve the breed by using our very best parents, and the puppies we're producing show their excellent quality in outstanding coats and highly unusual colors and markings, as well as the greatest temperaments we have ever seen. You simply have to see and handle them to believe it, and we encourage you to schedule an appointment to do just that. We are located in rural northeastern Custer County in the Wet Mountains, which are foot-hills of the lovely Sangre de Cristo Mountains, at an elevation of just over 8,200 feet above sea-level. Consequently, our dogs are healthy, hardy and strong, well able to handle the climate and lower oxygen level up here without heart problems, and we do not have heartworm. We're often asked if our dachshunds have back troubles, and the answer is a resounding NO!!! 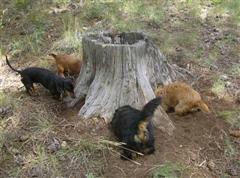 Our goal is to breed-out any and all weaknesses inherent in dachshunds and only to improve the breed. We don't keep "duds" in our breeding program - any that don't pan out, that produce defective puppies, or need to be retired for whatever reason, are found excellent permanent homes. We also do not permit any hint of viciousness in our dogs - we don't enjoy being snarled at or bitten any more than you do. We're pretty picky about who takes our babies home, and have terminated more than one sale-in-progress because the prospective buyer wasn't exactly the type we wanted for our puppies, or we suspected that the home environment could be hostile to our pup. We don't mean to be rude, selfish or cruel, but if something doesn't feel or sound quite right to us, it usually isn't. Our puppies deserve the very best people and homes we can find for them! Our dogs are available to be seen BY APPOINTMENT ONLY, so if you wish to see any of them in person, you'll have to call 719-783-2955 and set up a day and time to come up the mountain - we are open for visits daily, ONLY between 2:00 and 4:00 p.m. WE DO NOT ACCEPT PERSONAL CHECKS OR CREDIT CARDS, so please bring cash in hand - it's at least 17 miles to the nearest ATM! (The nearest towns, Canon City, Westcliffe, and Florence all have ATMs available.) If you intend to use PayPal to pay for your pup with a debit or credit card, please do it from YOUR computer! We look forward to meeting you, and would like nothing more than to place one or more of our wonderful dogs in your arms, making you new members of our growing family of fellow doxaholics! We are enthusiastic supporters of our armed forces and their families, and are thrilled whenever an active-duty or retired military member chooses to take home one of our dachshunds. doing what they were bred to do! 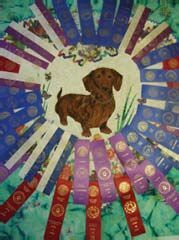 A small fraction of the ribbons won by Flickennel dachshunds, and the tradition continues today with our dogs being shown - and winning! 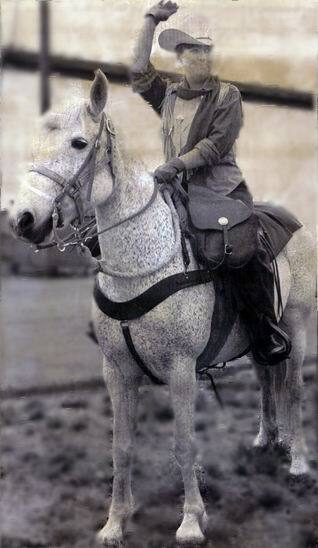 Below is a picture of Martin Knifechief wearing a Plains Indian chief's headdress, over 150 years old when this photo was taken in the 1980s, and Janet's sister, Ann Miller, both in authentic Indian costumes, riding two of Janet's mustangs at the first-ever Mustang Gymkhana held at Canon City, Colorado. Janet helped set up this Gymkhana while she was the Colorado State Coordinator for the AMBA. Janet Flick as the Colorado State Coordinator for the American Mustang and Burro Assn., (AMBA) riding one of her mustangs from the Canon City, CO post office to the Cripple Creek, CO post office in a Pony Express reenactment in 1992. The whole trip took 45 minutes by relay riders on what is called Shelf Road, a one-lane dirt road that clings part of the way like a shelf to the crumbling side of a cliff! Bet you don't get your mail that fast today, and the mail carrier even has a truck!